As you are aware a common technique used to unravel the concept of "It Wasn't Your Fault" as it relates to sexual abuse with young children, is to use play therapy. On this track, we will look at the ways play therapy can be used when dealing with repetitive rituals, control, and regressive behavior. We will also look at when setting boundaries in play therapy would be beneficial. 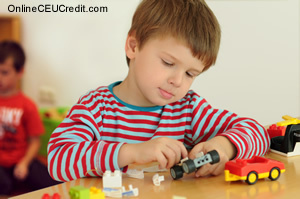 Blake, age 8, who had been sexually abused at the age of four by his babysitter, loved to continually assemble, disassemble, and reassemble the same building with LEGO plastic blocks. He would come into the session, go straight to the LEGO table, pick out the same blocks, and assemble the same six story skyscraper. Then he would disassemble it, neatly placing the separate pieces on the play table. Blake would take apart his creation three or four times during one session and then reassemble it. During the construction and destruction of his building, I would remind Blake, "Things that are broken can be fixed and need not stay broken. Sometimes people may feel broken, but they can get better and feel whole again too." My purpose was to instill in Blake a different perspective and to begin to facilitate an attitude of healing. Prior to the sessions, Blake had a recurring nightmare in which he was in a park, handcuffed and being abused by a policeman. Within a few weeks, he dreamed that he became a fire breathing dragon, melting the handcuffs. Although Blake continued to have occasional nightmares, they did not overwhelm or devastate him. You might consider observing your Blake and his or her patterns of repeated rituals in your next session. Is there a way you can reframe your client's behavior? Lindsey's parents were divorced and there wasn't stability in her life. Lindsey, age 8, had been living with her mother, Rita who was working and unable to take care of Lindsey after school. As a result, Lindsey stayed at a neighboring couple's house until her mother returned home. After a few weeks, the husband, William, who was the only one home when Lindsey first got home from school, started molesting her and eventually, raped her. When Lindsey first told her mother about the assault, her mother did not believe her and would scold her for accusing William. Finally, Rita reluctantly referred Lindsey to therapy. Lindsey, age 8, spent her play therapy focusing on playing one particular card game, Go Fish, throughout the course of several sessions. By repeating this game over and over, I felt it possibly was her way of working through the trauma of her sexual abuse. Here were my thoughts. See if you agree? The repetition of the Go Fish card game created a predictable relationship with me; a means of counteracting or controlling her otherwise chaotic world. In our sessions, Lindsey would frequently try to change the basic rules of the game or blatantly cheat. I felt Lindsey's need to control the game and its rules were a possible means for her to control her environment in light of the trauma of William's sexual assaults and her feelings of helplessness. In addition to gaining control of her environment, Lindsey was able to start to rebuild her sense of competence, simultaneously decreasing her feelings of vulnerability. Think of your Lindsey who repeated plays the same game, changes game rules and or blatantly cheats. Is he or she trying to transition from helpless victim to a controller of her environment? Undoing what was done through assembling and disassembling constructed objects; changing game rules to decrease feelings of helplessness; let's look at facilitating regressive behavior through play. Amanda, age 12, went through a period of regressive behavior as a result of her trauma of being sexually abused by her stepfather. As you are well aware, regressive behavior is often displayed early in therapy. During this regressive period, 12 year old Amanda fed herself with the baby bottle. I interpreted this behavior for Amanda by saying, "Sometimes when we are upset or frightened, it feels safe or helps to do baby things for a while, and to go back to a time when things felt safe. Does drinking from the baby bottle feel safe and comfortable for you?" Obviously, the drinking from the baby bottle transported Amanda to a pre-trauma developmental stage. When a child needs to regress, I feel it is beneficial to keep a few toys that would facilitate this behavior, such as a baby bottle, clay, finger paint, and cuddly stuffed animals. Although I, like you, am aware of the fact that regressive behavior is only temporary, I find that it's important to inform parents that their son or daughter might be exhibiting these behaviors at home. I also assure the parents that this phase will probably not last for a long period of time, but may be important to the child as he or she works through their abuse. 2 Tools to Assist your Client in Accepting the Abuse "Was not their Fault." Now let's look at setting boundaries during this play therapy. Obviously for play therapy to be truly successful, the child must feel that he or she has the unbridled freedom to express themselves. But the challenge is, how far should the child be allowed to freely express him or herself and at what point would setting boundaries benefit the client? As you are aware, the physical expression and channeling of destructive impulses must be directed towards symbolic objects like punching bags or padded bats. I have these objects as focal points in the room, so that the child will understand that this punching and hitting is not acceptable behavior towards actual people. Thus, the limit I set is: the only thing the child cannot do is hurt themselves or me. In addition to restricting destructive impulses to symbolic objects, another boundary I set regarding expression of anger, is related to drawings. I personally feel drawings must remain in the therapist's office when the child leaves. This way he or she knows that none of the negative emotions being dealt with in therapy will spill over into everyday life. As you know, when a sexually traumatized child does express his or her anger, it can be primitive and unpredictable. If that anger should be displayed in any other place besides treatment, the child could misunderstand the balance between it being OK to express their anger in therapy and letting their emotions control them in real life. Thus I use the retention of the art work in the office as a means of setting this limit. It goes with out saying letting a child know that no physical contact will occur, comforts them. I stated to Amanda, "While we're in this room, we'll only be communicating through playing and talking. This way, you can learn to express your feelings through words instead of violence towards other people." In addition to repeated rituals; helplessness versus control via card game rules; and facilitating regressive toys, use of a pet seemed to be beneficial in reaching Doug. Doug, age five, who was seriously abused by a male while playing unattended at a local playground. When his mother brought him to me for therapy, she described him as almost totally mute since the day of the abuse. After his mother left, Doug sat on the edge of the chair and stared into space. I made several attempts to communicate with him, but he remained unresponsive until he got up out of the chair and huddled on the floor with his back to me. After a few minutes, my small cocker spaniel, which had been asleep under my desk, woke up. Thinking that Doug might feel safer around the dog, I rolled a ball in Doug's direction. The dog noticed him sitting huddled on the floor and tried to engage Doug in a game. At first, the dog sat quietly and then slightly nudged Doug without any response. Finally, the dog let the ball drop and it rolled in Doug's direction. Then Doug slowly began to pet the dog and cautiously rolled the ball back. Over a period of several weeks, Doug continued to play with the cocker spaniel and soon made the transition from playing with the dog to interacting with me. What is your agency's policy on pet therapy? If you had not thought about the use of a pet in therapy, you might turn your CD play off and think of the pros and cons as to the appropriateness of this tool for your practice. On this track we discussed some ways to use play therapy when dealing with repetitive rituals, control, and regressive behavior; as well as looked at setting boundaries and pet therapy as tool to assist you client in steps towards accepting that the abuse "was not their fault." On the next track, we will examine the Family Stance and the Family Trance and the two techniques of the "Other Family" exercise and the "Family Mottos" exercise. In play therapy what is one interpretation of a client repeatedly assembling and reassembling the same object; changing game rules; and regressively drinking from a baby bottle? To select and enter your answer go to Answer Booklet.